Whether you're hosting the annual company dinner or a wedding, candles always help to set the mood. The Event Candles are perfect for the event planner in your life. Use these candles for events or simply to add mood lighting to your home. For over 40 years, tag has been equal parts design, functionality, color, and value; creating gifts and decorative accessories for the home. tag has something for everyone and every room with collections that feature a wide array of products that are sold year-round, as well as seasonal products that help bring that special touch to any holiday decorating. ADD A LITTLE LIGHT: The Event Candles are the perfect way to brighten up any room! Whether you're setting the mood for a romantic date, or just trying to add a little more light to your home, the Event Candles are just what you're looking for! PERFECT FOR EVENT HOSTING: Candles are the ideal way to set a calm mood. Whether you're getting ready for a wedding or hosting the annual company dinner, candles add elegance and natural light to any event! 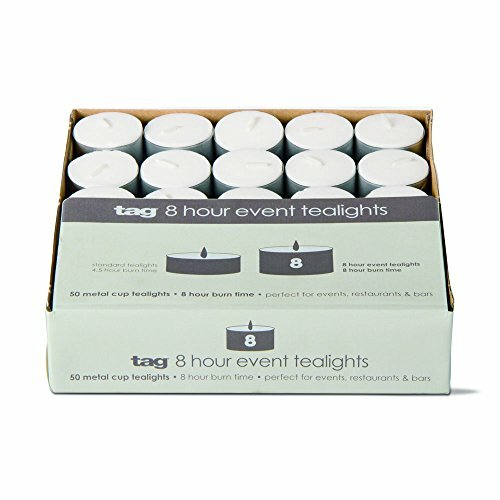 8 HOUR BURN TIME: The Event Candles from tag feature an 8 hour burn time, nearly double the average length for tealights! MAKES A GREAT GIFT: The Event Candles make a fantastic gift for the anyone in your life! Great for birthdays, get-wells, and more. Modern Tabletop Tea Light Set - Brown and Copper - Contains 3 Tealight Holders, Glass Beads, and Leaf Shaped Tealight Tray.